Double-suction submersible motor pumps for sustainable post-closure care and maintenance in German mines. At the end of 2018, the centuries-old tradition of mining hard coal in Germany came irrevocably to an end when the last remaining collieries were closed down. Following years of debate, a joint decision was taken by politicians, industry, and the trade unions in 2007 to close down all mines. This is because German coal can only be mined under extremely difficult conditions and only from extreme depths. 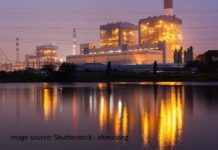 In order to compensate for the impact that this effort has on the price, state subsidies are needed if German coal is to be able to compete on the market at all. However, the term “closure” in connection with mines sometimes conveys the wrong impression because the mines are far from being at a standstill just because actual mining work has come to an end. On the contrary, the operators are responsible for ensuring that the mines are cared for and maintained in the long term in a process that is, above all, sustainable. This includes socially compatible personnel adjustments, but also rehabilitation of former mining areas, repairing and rendering safe any mining damage, as well as responsible water management. The latter, in particular, is one of the most crucial, eternal missions – work that will be needed long after the year 2018. Systematic water management has so far dealt primarily with ensuring that the effects of industrial mining do not cause pit water to enter mines that are still active. This is no longer needed after a mine has been closed. When mining work stops, the main concern is to ensure that the mine water does not mix with the ground water above it. Mine water is rainwater that seeps into the ground and solubilizes various salts and minerals from the layers of soil on its way through them. Due to this absorption of minerals, any contact with the layers containing drinking water must be avoided at all costs. The mining company RAG plans to let the mine water rise to a point where there is still a safety margin between the mine water and the drinking and ground water. To do this, RAG will have to pump around 110 million cubic meters of mine water. 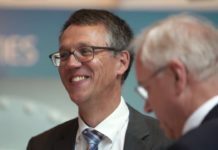 This is a challenge that can only be overcome with expert knowledge, a powerful team of 300 specialists, the latest technology, and high financial commitment – RAG currently expects annual costs of over 100 million euros. In the course of the historical shift of mining operations in Germany to the northern part of the country, a largely continuous network of mine workings was created. These connected mines made it possible to combine the pump locations of disused mines to form so-called “water provinces” after closure of the last pits. Thus, the mine water can be pumped centrally from a depth of around 600 meters at several combined water drainage locations. RAG is currently collecting the mine water from the mines still operating at 13 water drainage locations. When hard coal mining comes to an end, only six -of these original mine water drainage locations are to remain. However, RAG’s longer-term mine water concept not only plans to reduce the number of water drainage locations, but also to convert them to drinking water wells. This will not only reduce the number of disposal points, but -also do away with the need for expensive maintenance and upkeep of underground infrastructure. The solution used so far, with centrifugal pumps installed in a dry environment, requires an underground machine room and a corresponding supply of fresh air. Submersible motor pumps are now used here instead of high-pressure pumps installed underground in a dry environment. Shrouding tubes are inserted into the shafts for this purpose so that the pumps can be brought from above ground to the level where the water is flowing and pump out the mine water. In combination with this pumping technology, the pumping depth of the mine water can be reduced, thus achieving high energy savings. This depth is currently in the region of 1000 meters in the Ruhr District and 800 meters on the River Saar. The goal is to allow the water level to rise as far as possible, without allowing it to mix with the ground water, and to leave a generous safety margin between the flows of water. The gap between the two zones is thus several hundred meters. This diminishes the pumping height, which again leads to lower energy consumption for water drainage. Implementation of this concept to resolve the problem of mine water in the long term places very high demands on the manufacturers of suitable pump technology. Pumping large volumes of liquid from great depths generates very heavy loads. Up to 30 tons of axial thrust are produce and have to be eliminated. The answer: Two solutions are better than one. 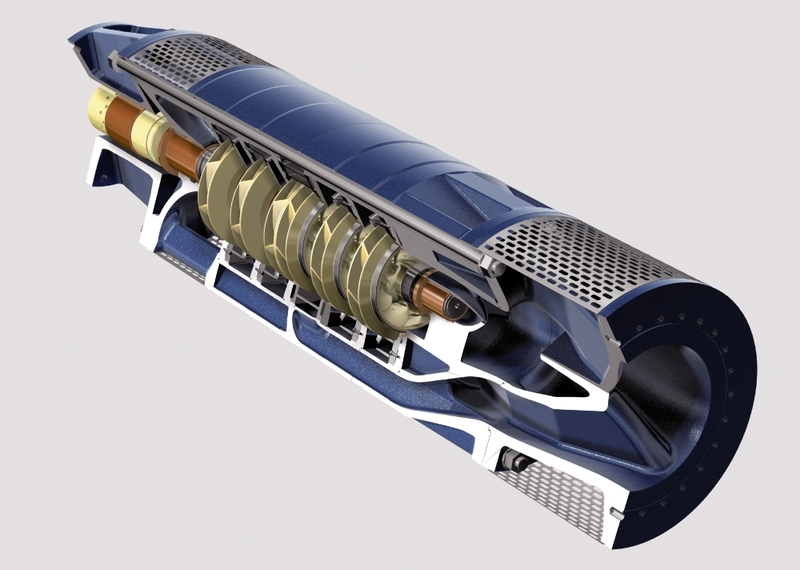 A design with a double-suction submersible motor pump can fully compensate for the axial thrust. At the moment, there are only very few manufacturers on the market who can supply this special pump technology needed by RAG, and there is only one that also has the necessary references and operating experience: Andritz. International technology Group Andritz produces and supplies double-suction submersible motor pumps through its subsidiary Ritz Pumpenfabrik GmbH & Co. KG, with headquarters in Schwäbisch-Gmünd, Germany. These are multi-stage, double-suction submersible motor pumps that can fully compensate for the axial thrust and have 50 percent less flow speed. The economic advantages are maximum operating reliability, minimum wear, and an extremely long lifetime of more than 20 years. Every pump with heavy-duty mining (HDM) technology is customized from standard modules for the specific application in hand. 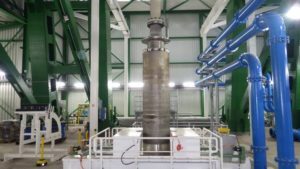 Hundreds of these pumps – including the largest submersible motor pump in the world at over 22 meters long – are operating successfully all around the world, for example in the most important mines in China or South Africa. Beneath the old gold mining town of Johannesburg is a lake containing strongly contaminated, acidic water. This lake is expanding horizontally and vertically through the disused mines. The water is becoming an increasing problem because rain water seeps into the tunnels and reacts with residual minerals like pyrite, forming corrosive sulfuric acids. In the worst case, this can result in a pH-value of 2, which is enough to cause permanent damage to man and the environment. 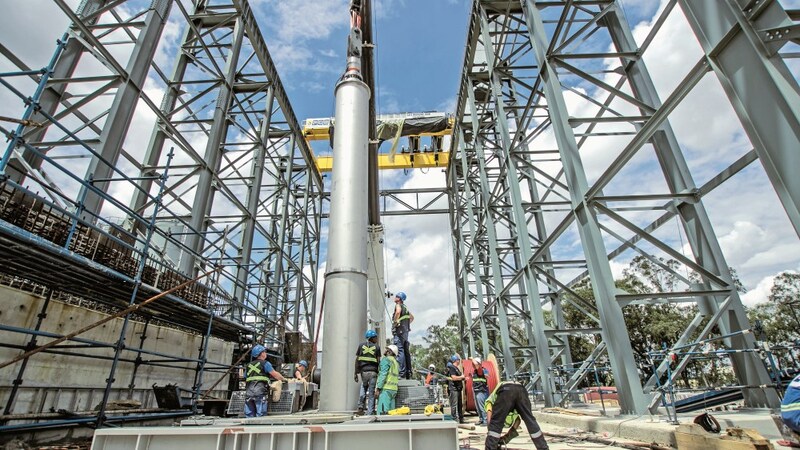 In order to counteract this horror scenario, Andritz has installed two heavy-duty submersible motor pumps in the so-called Central Basin of Johannesburg. Each pump is able to transport 1,500 cubic meters (= 1.5 million liters) of water to the surface per hour. In this way, 60 million liters of water are pumped out every day and brought to a nearby water treatment plant. With this capacity, it would even be possible to completely fill the Cheops pyramid, the largest of the three pyramids of Gizeh in Egypt, with water in a little over one month. The long-term goal in Johannesburg is to lower the water level of the flooded mine far enough to begin mining the gold ore again. In view of the corrosive medium to be pumped, the pumps have been customized for this special application in South Africa. The design is based on the tried-and-tested Andritz HDM (heavy duty mining) technology, which is the concept using a double-suction pump. The axial thrust generated by the hydraulics is compensated by the opposing arrangement of the impellers, with the result that the pumps operate free of axial thrust. Thus, they can achieve a service life of up to 15 years and more if properly maintained and serviced. 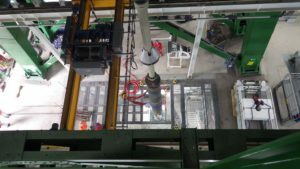 As an additional feature, the submersible motors were completely encapsulated specially for the project in Johannesburg. This technology makes it possible to create internal pressure in the water-cooled motor that is higher than the external pressure. As a result, the corrosive water is prevented from entering and the components inside the motor are protected. This product feature is another of many small but essential, innovative aspects of this Andritz product series. For the RAG project in Germany, pump specialist Andritz will manufacture and deliver a total of three double-suction submersible motor pumps like those for the South Africa project based on the patented HDM (heavy duty mining) technology, which has proved its worth several times over. 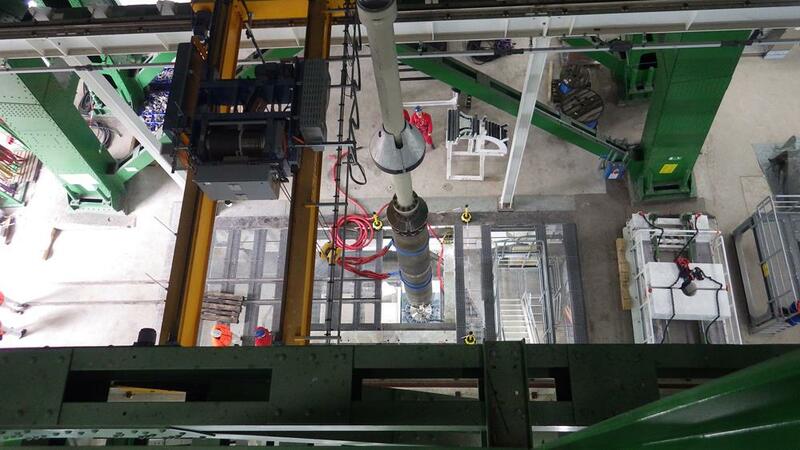 With a weight of 13,200 kilograms, the pumps are placed freely in the shaft underneath the shrouding tube. At a speed of 1470 revolutions per minute, these hydraulic machines achieve an efficiency of 81 percent and convey 530 cubic meters of water per hour from the depths of the former mine over a head of 830 meters. In order to achieve the necessary capacity, each of these submersible motor pumps is equipped with a special water-filled, high-voltage submersible motor. This motor provides efficiencies of 91.5 percent and a rated capacity of 1,750 kilowatts. These are four-pole motors as they are much more robust than two-pole designs. As a result of the longer lifecycle this provides and the lower wear, these motors guarantee significantly higher operating reliability – absolutely indispensable for this particular application. Additionally, over one thousand meters of cable were laid for operation and monitoring of the pumps. While a thick, five-kilovolt cable provides a reliable supply of electricity to the motor, a manometer ensures that each pump always has the necessary counter-pressure to start up. Furthermore, the temperature of the motor is controlled by means of platinum sensors. The danger from methane gas is monitored by measuring hoses in the shrouding tubes. When the drinking water well goes into operation, one pump conveys the mine water first of all, and a second pump may be added if necessary. The third pump is available as standby. With this overall concept, the technology is excellently suited to begin reliable and sustainable operation in the long term.